In 1967, while the ‘Summer of Love’ was going on in San Francisco, Sturm, Ruger & Co., Inc. began designing its Mini-14 autoloading rifles in Southport, Connecticut. Those two events have absolutely nothing to do with each other, but I have an affection for both, I guess. Call it a butterfly effect thing. Either way – in 1973, after spending 6 long years in development, the Ruger Mini-14 was introduced. It is a rifle which is still being produced today, and it remains one of the most popular weapons in Ruger’s extensive catalogue of firearms. Named ‘Mini-14’ as an homage to the military M14 rifle which it resembles externally, the rifle was designed by inventors Leroy Sullivan and Bill Ruger. Internally, though, it bares a closer resemblance to the M1 Garand, with its self cleaning fixed-piston system, and rotating bolt operation. The M1 Garand system was designed back in the 1930’s, and Ruger did not hesitate to implement this seemingly older system into its 1960’s design. Why? Because it works, plain and simple. Over the years, Ruger has improved on its original design (more on that a bit later). There have been several variants of the Mini-14 available for law-enforcement and civilian use, and I will attempt to go through some of these different models in this article. 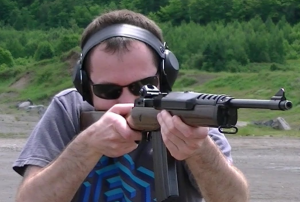 So many people are busying themselves with futuristic firearms – and there is nothing wrong with that – but I hope I can give you an idea of why this is still such a great rifle, even after 40 years, in my Ruger Mini-14 Semi-Automatic Rifle Review. Mini-14 rifles come in many different capacities, finishes, barrel lengths, calibers, and more. So, let’s kick this thing right off, with some of the technical specifications of a basic, entry-level Mini-14 Ranch Rifle, model 5817. Cartridge – .223 Remington / 5.56X45mm NATO (these are not the same thing, but this weapon will chamber both). Action – Gas-Operated, Rotating Bolt. Barrel length – 18.5 inches. Stock – Fixed, Synthetic stock. Sights – Protected Blade Front Sight, Adjustable Aperture Rear Sight. The materials used in the construction of this rifle are mainly cold hammer-forged stainless steel. Many firearms these days are made using aluminum and/or polymers of some kind, but the Mini-14 goes in a different direction with the steel. The attributes of stainless steel give the Mini-14 a kind of ruggedness and durability that not every rifle can match. Plus, if you live in an area where corrosion and weather may be an issue (such as by the ocean), the Mini-14 is a great option. Not many semi-automatic rifles are made this way, and the Mini-14 manages to provide a solid solution in those particular cases. Blah blah blah, design, materials, it’s a classic, yeah, yeah, yeah – but how does the thing shoot?! Really well, as a matter of fact. I don’t own one, so I can’t give you a detailed account of its use over the years, but I have had the pleasure of shooting it. It has a nice smooth action, and it is a gun that can grow on you. Let me put it this way – it’s on my wishlist. To quote George Carlin, this rifle is “new wave, but old school”, and it would be great to own one someday. It isn’t just about nostalgia, of course, although there is no shortage of that with this rifle. In fact, as long as I am wishing for stuff, the .300 BLK version would be cool to have. The Mini-14’s performance is what you would expect from a rifle modeled after such worthy firearms as the M14 and M1 Garand. It lives up to its name – and the names of its predecessors – and it made Bill Ruger very proud, indeed. In fact, Ruger stated that had the Mini-14 been produced several years earlier, he had no doubt that it could have been an excellent standard issue rifle. You know what? He’s probably right. This thing is light enough and powerful enough to be a soldier’s best friend. It strips down without the use of tools and with no problems, it is easy to clean and maintain, it can withstand many climates and conditions, and is known to barely ever jam or malfunction. What more do you need in a military rifle? Recoil is more than manageable, and proper follow-up shots are easy to obtain with the Mini-14’s sights (especially the new ones). Some say that the Mini-14 likes rounds which are more on the heavier side, but I wouldn’t know about that. Simply haven’t used it enough to pass judgement. Like I said, the thing which struck me was that it is easy to shoot. 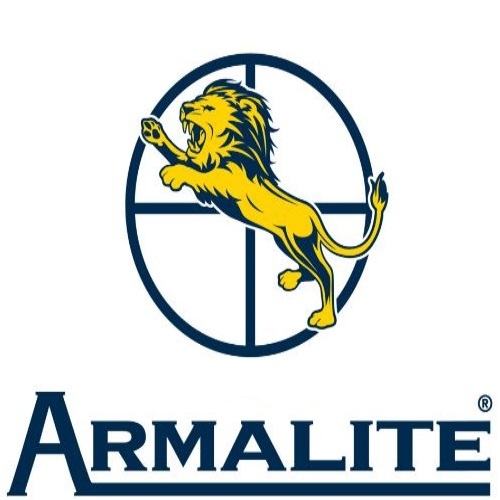 I doubt that I would notice any difference in ammo, personally, unless it was crappy, low-grade ammo. It also depends on the model and make you are shooting. I was able to fire nice-sized groups without any problems. The 20-round magazines give you a lot of options, whether you are everyday-plinking or target-shooting. 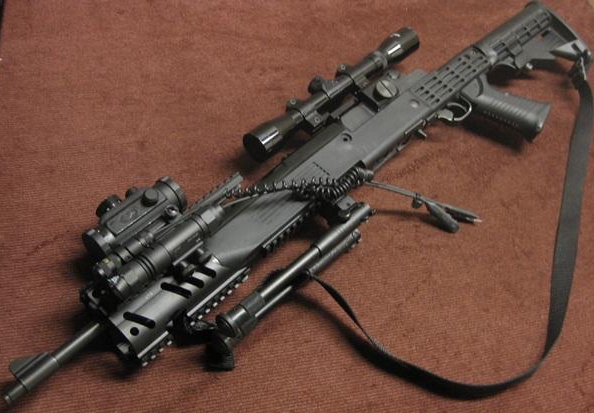 As for firepower – this rifle can be fitted with 5-, 10-, 20-, and even 40-round magazines. The 5-round mags are flush against the bottom of the rifle, but the others stick out. Depending on the state you’re in, and on your local laws and regulations, different rifle models and corresponding magazines are available. I cannot stress this enough: make sure you comply with your local law-enforcement regulations. You seriously don’t want to spend good money on a rifle or magazine you cannot use. Save yourself the frustration of discovering this later, and get to know your local laws in advance. Also, lest we forget that it could land you in a heap of trouble with local and federal authorities, and nobody wants that. There are several configurations of the Mini-14, the most basic of which is the Ranch Rifle. The Ranch models usually come with a wooden or synthetic stock, and commonly have a 18.5-inch barrel. The standard capacity for the Ranch is 20 rounds, but in some states these rifles are sold with a 5-round magazine. The Ranch Rifle series was introduced in 1982, and found immediate success. Having a scope mount, an option for different stocks, and folding rear sight, made it a popular weapon. It remains one of the oldest variants of Mini-14 to date. In 1987, production of the Ruger Mini-Thirty began. This was an offshoot of the Ranch Rifle, chambered in the awesome and powerful 7.62X39mm round. This is the same round which the AK-47 uses, and it is no surprise that it is one which many ranchers and non-ranchers adore. The 5.56mm and .223 Remington are great, but there is just something about that 7.62mm round. 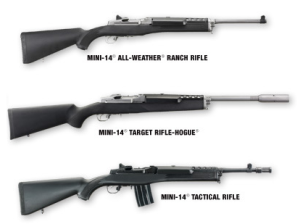 In the early 2000’s, Ruger made more changes to the Mini-14. They made the barrel heavier (which increased its stability), improved the gas-piston-system, gave the rifle better sights, and added a more comfortable scope mount, to name a few. Ruger listened to its customers, and managed to release an improved Mini-14 which kept its classic form without compromising on performance and efficiency. As the saying goes: the more things change, the more they stay the same. It’s still a Mini-14. 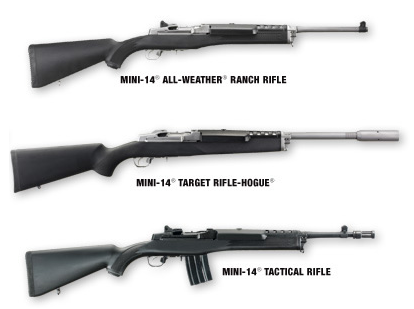 Building on these improvements, Ruger released a few Mini-14 variants in relative rapid succession. The Target Rifle, Ranch NRA model, and Tactical Rifle were released in 2007, 2008, and 2009 (respectively). The Target Rifle model has a 22-inch barrel, and it was Ruger’s answer to those who claimed that the Mini-14’s accuracy was lacking, compared to its reliability and ease of use. Ruger decided to introduce a Mini-14 whose minute of angle (MOA) can be fine-tuned. The Target Rifle retains the M1 Garand-style action. It comes with no sights, but with scope rings and a picatinny rail mount. It is designed to fire .223 Remington, but not 5.56mm. As mentioned in the Ranch 5817’s specs, these two calibers are not the same thing, though many times they are mentioned in the same breath. The Ranch Special Edition NRA model came with a short 16.25-inch barrel, two 20-round magazines (where applicable), and a polymer stock with a golden NRA medallion set into it. Its sights are also more comfortable to adjust, and their looks harken back to the original M14. For every NRA model sold, Ruger donated a certain amount to the NRA’s legislative lobby. The Tactical Rifle was released with a 16.12-inch barrel and birdcage flash suppressor. One specific model (5846), of the five which are available, comes with a 6-position collapsible/folding stock, finger-groove pistol grip, and picatinny rails. It is primarily chambered for .223 Remington and 5.56mm NATO. In 2015, Ruger introduced the Tactical Rifle model 5864, which comes chambered in .300 AAC Blackout. The Mini-14 GB – This comes with a pistol grip, standard or side-folding stock, 20- or 30-round magazines, bayonet lug, threaded barrel, and flash suppressor. AC-556 – A series of select fire versions, designed for military and law-enforcement. This model has no safety, and instead features semi-automatic, 3-round burst, or fully automatic modes. Comes with bayonet lug, 13- or 18-inch barrel, and flash suppressor. This series was discontinued in 1999. Not to be confused with the Ruger SR-556 or AR-556. .222 Remington – In 1984, Ruger produced these Mini-14 units for the European market, but discontinued them shortly after that. Mini-6.8 – Produced in 2007, and discontinued in 2012, this was a model which made use of the 6.8 Remington Special Purpose Cartridge round. Sling – Pretty obvious, I know, but worth a mention nonetheless. Sling swivels are also bunched in there. Get a good sling, and it can last you a long time. It provides freedom for your hands and it lets you carry it with the greatest of ease. From a regular strap to something more “tacticool”, you can’t go wrong with add a sling to your rifle. Barrel Clamp – Mini-14 units, especially the older ones, were the subject of accuracy complaints. It was said that once you get shooting, particularly in rapid fire, your group starts to shift and spread. The barrels heat and other conditions inside the rifle could cause it to drift off target, and installing a barrel clamp can help to reduce the heat and pressure, allowing for greater accuracy and a better shooting experience. Optics – Scopes, red dots, magnifiers, lights, lasers, etc. There is a whole universe of optics accessories for sale, and depends on your needs, you will be able to find the product for you. Just a word or two of advice: do not go cheap. Get the best you can afford, because optics count for a lot. This may not be as imperative if you are just a Wednesday-afternoon Coke can plinker, but it still counts. Also – in many cases, an accessory’s price will not necessarily reflect its quality, but in the case of optics, it usually does. 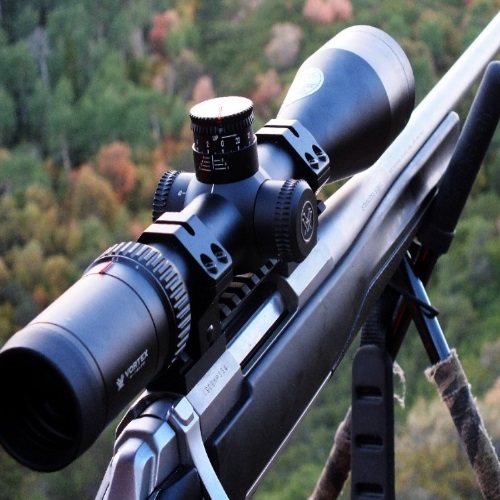 Muzzle break – A good way to ensure proper follow-up shots is by reducing muzzle climb, and that can be done with the help of a muzzle break. I didn’t see too many around for the Mini-14, to be honest. They just make good sense for rifles in general, which is why I am mentioning them. Many more accessories are available, of course, this short list contains just a few which could be helpful to those considering buying the Mini-14, and would make shooting it that much better. 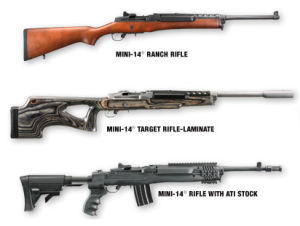 The Mini-14 series has a large variety of factory and aftermarket stocks and magazines available. Some magazines are restricted by state laws and regulations. Magazine capacities vary by model and caliber, but essentially you can find 5-, 10-, 20-, 30-, and even 40-round magazines for the Mini-14. A 90- or 100-round drum is also available. Not too practical for many uses, but a lot of fun to shoot, I am sure. The Mini-Thirty also has 5-, 10-, 20-, and 30-round magazines available for purchase. Rubber Over Molded Stock for Mini-14/30, by Hogue. 6-position Strikeforce Mini-14 Stock, by ATI (the same one which is on the Tactical 5846). Intrafuse Tactical Mini-14 Stock, by Tapco. So, to sum up, Ruger’s Mini-14 and Mini-Thirty series of rifles are ones which have stood, and are still standing, the test of time. They are a pleasure to shoot, and (no doubt) to own. More improvements are being made over time, but the spirit of the rifle stays the same. It is that same spirit which brought Sullivan and Ruger to create a scaled down model of the military M14 which now still blows in the halls and laboratories of Ruger’s team of engineers and firearm specialists. The Mini-14 is now celebrating 40 years of being a landmark rifle, and I have a feeling it will continue to be a popular choice for many years to come. Thanks for checking out our Ruger Mini-14 feature – check out our LC9 and LCP reviews while you’re here at Gunivore!